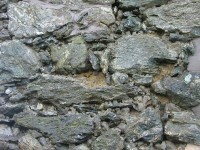 Repointing will be required when the bedding or jointing mortar becomes perished and flaking. If left un-repaired the rainwater will readily penetrate to the heart of the wall and encourage further deterioration. It is possibly the most significant element to maintaining the “health” of the wall and enhancing the appearance. The correct repointing can assist in waterproofing and stabilizing the walls of the structure, extend the life of the wall and individual stones and enhance the visual qualities of natural stone walls. The importance of this cannot be overemphasised. Incorrect pointing can seriously reduce the performance of a wall and by implication a building. Water can become trapped behind dense mortar and not evaporate out, physical damage to stone and brick can result from poor work. 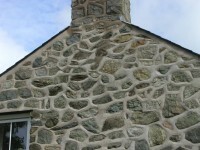 The traditional lime pointing actually has an advantage over using modern cement mortar in some situations as, being cement mortars being inflexible, hairline cracks can open almost immediately between mortar and stone. These cracks allow moisture inside the wall, where it becomes trapped. 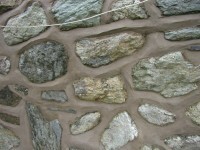 We will advise on the best mortar to use for your particular circumstances. 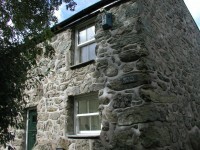 The property, on the Menai Straights, was originally a quarry man’s cottage constructed in the 16th Century. 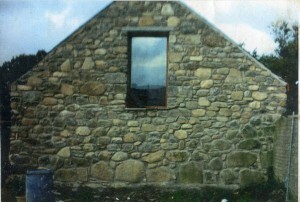 Rather than using dressed stones, to save money the building used any rocks available. 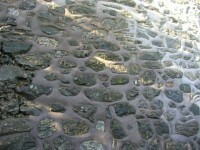 To support the large stones, smaller stones were used as wedges to hold them in place prior to applying a lime mortar. Over time this would have perished and was probably renewed a number of times in the past. In recent years a builder had attempted re-pointing but had undertaken a poor cheap job. The concrete was falling off and this was allowing water penetration causing major damp problems in the building. The exposed infill was washing away which would result in the wedge stones becoming loose and endangering the structural integrity of the building. Given time, a wall collapse was a certainty. To properly repair and restore the building was an expensive job taking 10 weeks to complete but once done the walls should not need further attention for the life of the current inhabitants. First the shoddy re-pointing was removed and loose materials raked out of the joints. Because of the wedges protruding beyond the stone face, flush pointing was not possible. The walls required proud pointing to cover the joints and wedges. 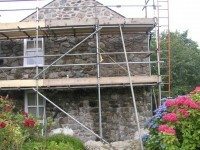 We undertake pointing and re-pointing works in Gwynedd, Anglesey and Llyn Peninsula including Criccieth, Pwllheli, Abersoch, Aberdaron, Nefyn etc.